Hungry to learn even more? Take it one step further by filtering the report for any individual ad unit that you would like to analyze. The Platforms report enables you to see which devices your ad units were viewed on, for example, on desktop or mobile. You can see and compare the traffic and estimated revenue coming from any platform. If there’s a big discrepancy between these two, you might want to check the desktop ad placement and find ways to optimize it to close the revenue gap as much as you can. 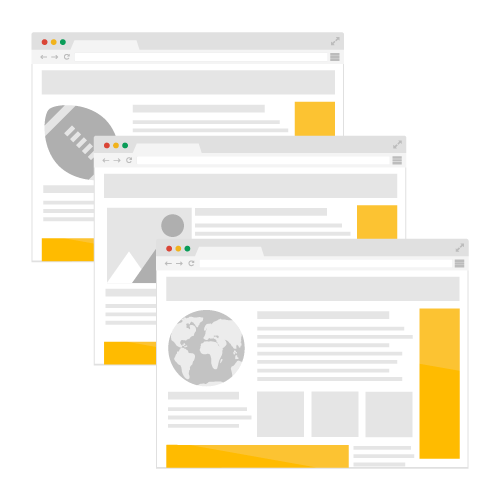 Manage multiple domains in your AdSense account? The Sites report can compare the overall performance of those domains. If you have different versions of one site (like one for desktop and one for mobile), you'll see them separately. If you have a responsive site you can add Platforms as a secondary report dimension to analyze your mobile and desktop performance separately. Start with these big five and you'll be getting a good basic view of how your site is running. Most of these reports can be found in the Common reports section under your Performance reports tab. You can also create your own reports and save them to run later. Have a favorite report? Share it with us in the comments! Sometimes it's a good thing to step back and look at the basics. 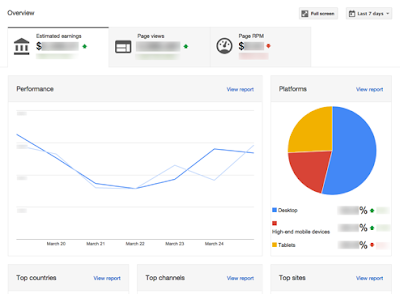 With that in mind (and with the new AdSense interface now in place), we'd like to recap the big five AdSense reports you should start with to analyze your overall account performance. Let's take a look at these reports. As the name suggests, the reporting dashboard gives you a quick summary of three main reporting metrics: estimated earnings, page views, and revenue per thousand impressions (RPM). 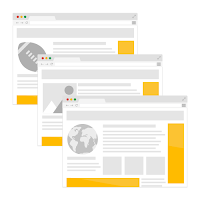 This report is a great way to get a quick check of your recent AdSense performance. You can switch to a wider date range, too, like the past month or year. If you see a sudden change in your results for any area, you can see a more detailed report with a click on the View report button. To see this report, visit the Performance reports tab, click Common reports on the left-hand panel and then select Entire account by day. Use the Entire account by day report to analyze your daily performance. Try selecting estimated earnings, impressions, CTR, and impression RPM to view them all at the same time and get a better idea of why your earnings change over time. For example, if the drop in estimated revenue is mainly due to a drop in CTR, take a closer look at ad units and ad placement to understand what caused that CTR drop. To use this report, visit the Performance reports tab, click Common reports on the left-hand panel, select Ad units and then add Platforms from the top as a secondary dimension. 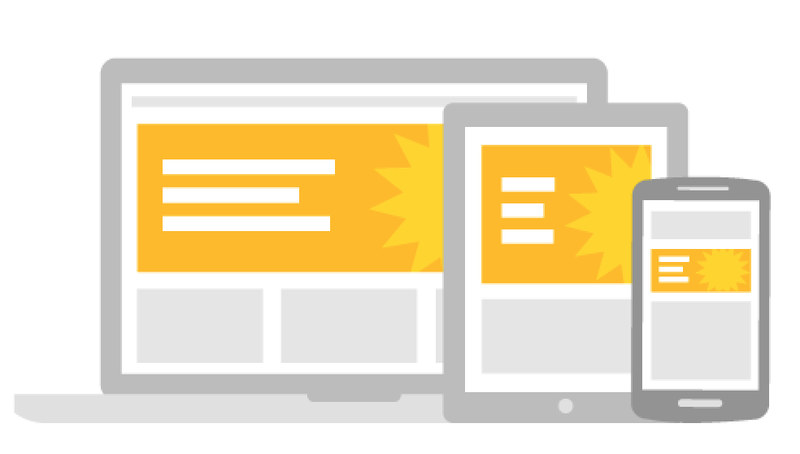 This combination offers a good look at how your ad units are doing on different device types. Maybe every ad is doing great across the board, or maybe some ad units are doing well on desktop but not on mobile (or vice versa). CTR and Active View Viewable are two key metrics to check first. Active View Viewable shows how many of your total measurable impressions were truly viewable. 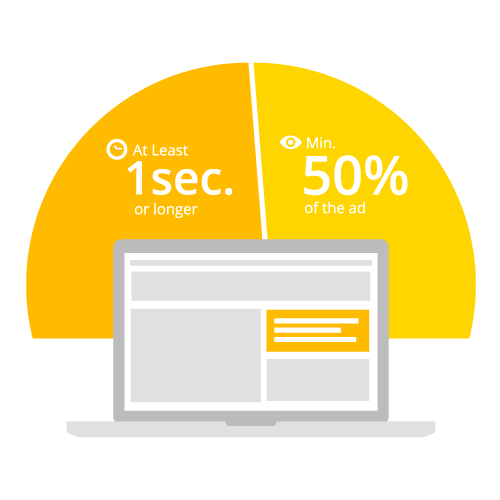 Google considers an ad viewable if 50% of the ad is visible for at least one second*. With some impressions, for instance, the visitor may not scroll down your page to see an ad. 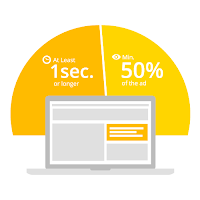 If an ad unit has an active view percentage below 50%, check the ad's placement and try to improve this.